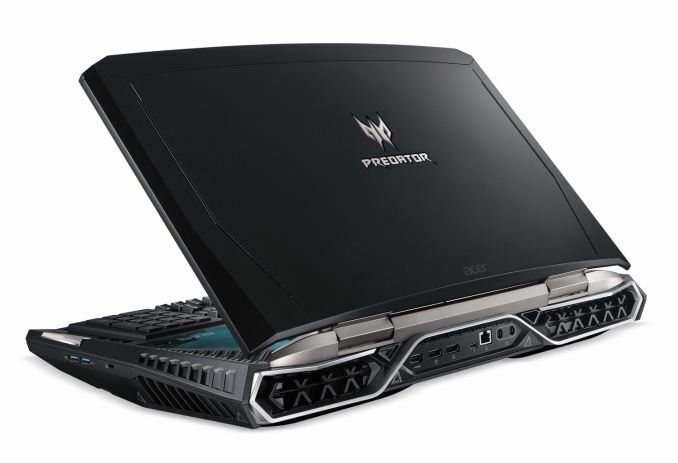 Today Acer is announcing a beast of a gaming notebook in the Predator 21 X. This is the world’s first curved screen notebook, and it should be enough to satisfy almost any gamer’s needs. Let’s start with the display, which is certainly a stand-out feature on this device. The 21-inch panel is massive for a notebook, and for some extra cool factor, it’s got a 2000R curvature. 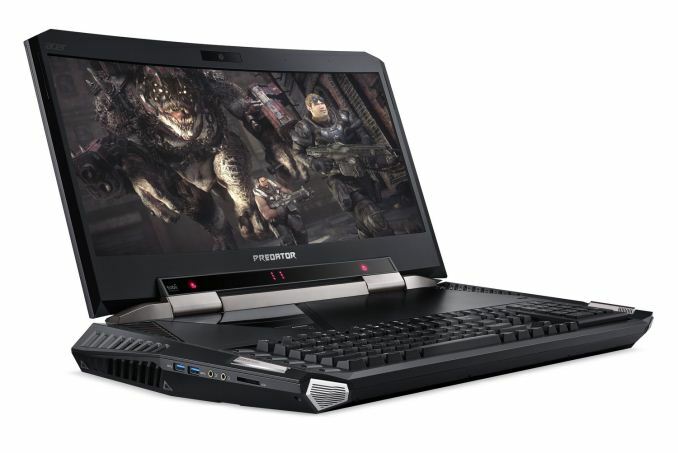 The 2560x1080 21:9 panel offers a 120 Hz refresh rate and NVIDIA G-SYNC technology, and it’s an IPS display. It also features Tobii eye-tracking, for in-game adjustments and more. Powering this gaming notebook is an Intel Core i7-7820HK overclockable CPU, and dual GTX 1080 graphics in SLI. IT can support up to 64 GB of DDR4 memory, and Acer offers up to four 512 GB SSDs in RAID0, with two of them NVMe PCIe storage, and two SATA drives, and they still have room for another 1 TB HDD. Killer’s Doubleshot Pro supplies the network connections in both wired and wireless flavors, and there is an 88 Wh battery. There is plenty of I/O as well, with USB 3.1 Type-C with Thunderbolt 3 support, USB 3.0 with always-on charging, and three more USB 3.0 ports. An HDMI 2.0 port is available for UHD output, along with two DisplayPorts which support G-SYNC output. There’s also a SD card reader, you know, for your camera. Following in the footsteps of the MSI GT80 Titan, the Acer Predator 21 X also features a fully mechanical keyboard with Cherry MX switches, and per-key RGB backlighting. 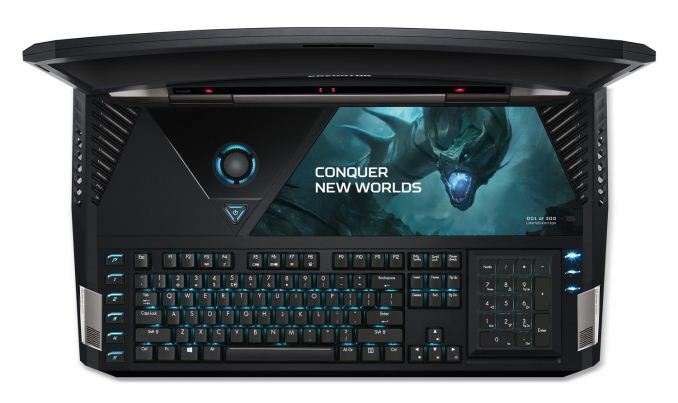 The Acer outdoes the MSI though, with a number pad that can be flipped over to be used as a precision touchpad. Acer has also though about audio, both on cooling system and speaker system. The cooling system features five fans, with three of them “AeroBlade” metal fans, and nine heat pipes, and to keep it clean, it features Acer’s DustDefender, which helps remove dust. Acer also allows the fans to be controlled with their CoolBoost app, so you can crank up the fans when needed. On the speaker side, Acer has a three-way speaker set, with a tweeter, midrange, and woofer, and there are a total of six speakers in the laptop, with two tweeters, two midrange, and two woofers. Acer says it will produce a “full spectrum of sound” and while I doubt that’s true, it should be an impressive step up from most laptop sound systems. Just in case you thought they might have missed a feature, Acer is also including a Windows Hello IR camera for facial recognition login, and they include Xsplit Gamecaster software as well. There is a maintenance panel about the keyboard which will feature a blue dragon logo, and the first 300 notebooks will include a limited edition series number on the panel. Below the panel you’ll find access to the RAM modules and one of the 2.5-inch hard drives. Acer is also including a hard-shell carrying case, which is a nice perk. It will be needed, since the laptop weighs just a hair under 20 lbs. 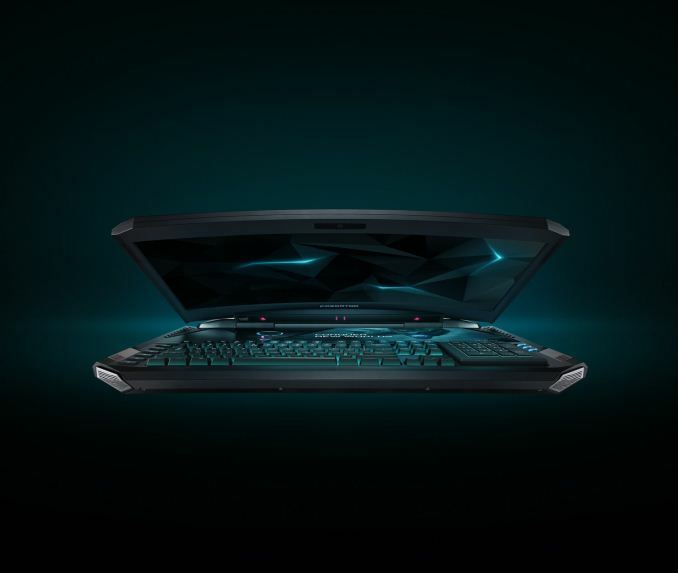 If you’re interested in the Acer Predator 21 X, shipments start in February starting at $8999. Yes, $8999. This notebook is hideous. They literally just asked what all of the current PC enthusiast buzzwords are (ultrawide, curved display, mechanical keyboard, RGB lighting), and designed a notebook that crammed all of that $hit in there.